Ask fellow campers about "Miami County Fairgrounds" and nearby attractions. We camp here every year to attend the Southern Ohio Forge & Anvil (SOFA) Blacksmith convention. This is a large county fairground with an active horse training facility and trotter track. It's a historic property and fairly well maintained. Camping with electric-only service is offered in the front and back fields. The front area has some road noise, the back section is quieter. Both areas are big rig accessible. A few paved sites with shared water connections are also adjacent to the grandstand, but those spots are not offered through the SOFA conference. Camping during SOFA is quite crowded. Shared electric service for 4 sites is provided on poles placed throughout open grassy areas, so everybody crams around the poles and you're right on top of each other. Tent campers also take up precious electric sites making the front area a real jumble, even though there's plenty of other fields to set up a tent. If you need electric service, there's more room to spread out in the back section than in the front. For a big gathering like SOFA, we're glad to have camping provided, even if it's a tight squeeze. And plan to come early if you want an electric site at SOFA-most spots are filled by noon on Friday! 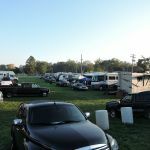 We camped at Miami County Fairgrounds in a Motorhome. K's on Main Street is an old-fashioned malt shop with the best burgers in town! Are you affiliated with Miami County Fairgrounds ?